Why should you go on an Everest 3 Passes Trek? A trail gives the Melodious music of the Dudh Koshi River. Various Rhododendron, Magnolia Forests and different kinds of wild and domestic animals around Sagarmatha National Park. The highland monasteries, the sacred maniwalls engraved with Buddhist prayers, colorful prayer flags portraying spirituality, the memorials, chortens. The Authentic Sherpa culture in the mountainous villages that we encounter during the Everest 3 Passes Trek. Enchanting and magnificent Himalayan sceneries of four of the world's eight highest peaks in Everest 3 high passes trek - Cho Oyu (8,201m), Makalu (8,463m), Lhotse (8,516 m), Ama Dablam and Everest (8,848m) adding lives in your life. Views of Ngozumba Glacier, Khumbu Glacier, Nuptse Glacier, Ama Dablam Glacier, and Lhotse Nup Glacier. The Gokyo Lakes and the Gokyo Ri from where 360 degree of Himalayan Panorama is seen. Of course the most remarkable lifetime achievement of 3 Passes Renjo La (5388m), Cho La (5380m) and Kongma La (5335m) in a single trip. What are the major attractions of EBC 3 pass trek? Trekking around the highest mountain in the World, Mt Everest. Includes three major mountain passes: Cho La (5380m), Kongma La (5335m), Renjo La (5388m). Beautiful view of Gokyo Lake. More adventure and sights seeing than Everest Basecamp trek. Everest 3 Passes Trek is for the daring adventure lovers located in the Khumbu region. The high passes include Renjo La (5360m), Cho La (5368m) and Kongma La (5330m). The trail of this trek is rugged and off-the-beaten. Exploring the massive creations of nature, you walk through the Sagarmatha National Park, which is rich in flora and fauna. The cultural richness of the Sherpa valleys adds more attractions in the trek. Three high passes trek in Khumbu begins from Lukla and walking above the Dudh Koshi River, you enter into the Sagarmatha National Park. Exploring the Sherpa culture and the bustling town, you take a route towards the Renjo La Pass. The Gokyo valley lies after trekking down from the Renjo pass, which is beautifully a lie beside the huge glacial Lake. An extra day hike to the Gokyo Ri is a further brilliant idea to explore the incredible vistas of the Everest region. The view of Everest (8,848m), Cho Oyu (8,201m), Makalu (8,463m), Lhotse (8,516 m), Ama Dablam, Ngozumba Glacier and the Lakes exceed the level of excitement. Crossing the Cho La Pass, you can feel the thrill of adventure excursion and the 360 views of the snowy peaks. The chill of the alpine altitude, tough walk in the thin air region are taken away with the breathtaking sceneries. After the Cho La, the trek leads you to the highest pass of Khumbu- Khongma La pass and completes the 3 pass trek in Everest. Exploring the cultural parts of the Sherpa valleys on the downhill trail, you conclude the trek in Lukla. Day 02: Sightseeing (shopping) day. Day 05: Rest and acclimatization day in Namche Bazaar. Day 07: Rest Day (climb up to Sunder Peak (5368m) and come down to Thame. Note: Above trekking hours and distances are approximate, and absolutely for general idea only. What are the visa requirements to visit Nepal? Do we need any special permit to visit Everest 3 pass trek? Immigration of Nepal offers visa on arrival to most of the foreign nationals except few countries. The fees structure are available based on the number of stay. Detailed information on Visa Information for Nepal is available in official Website. You can apply for visa online via official website of Department of Immigration. 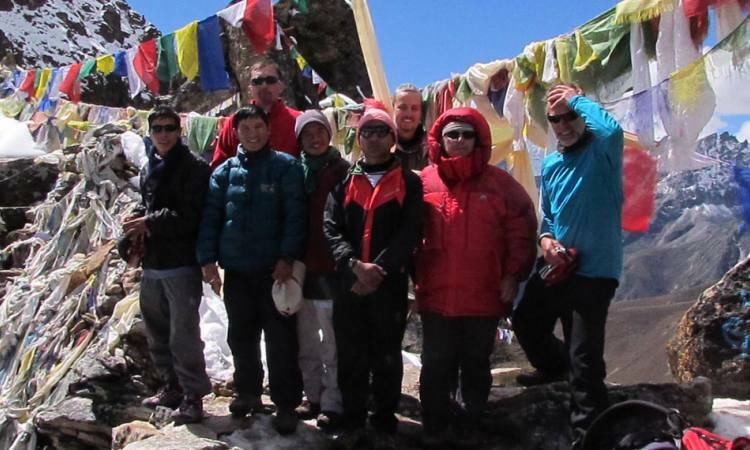 Alpine Excursion Treks and Expeditions leads Everest 3 high pass trekking with a complete arrangement of professional guides and porters along with other required services. All you need is Pack your bags and all your requirements for the best trekking experience in Nepal are arranged by our professional team. Want some more information or talk to us? Contact us now. Day 01Arrival at Kathmandu. Namaste and welcome to Nepal. Alpine Excursion Treks and expedition's representative welcome you warmly at the Tribhuwan International Airport and transfer to the hotel. You take rest and enjoy your meal in the evening. Overnight at Hotel. Day 02Sightseeing (shopping) day. After the breakfast, you set out for the sightseeing trip in the Kathmandu valley. Our expert tour guide shows you the UNESCO world heritage sites, which include Pashupatinath (the Hindu temple), Boudhanath (Buddhist stupa), Swayambhunath (Buddhist stupa and temple). Then, return back to the hotel. If you have to shopping, you have time to do. Overnight at Hotel. Day 03Flight to Lukla (2840m) and 3 hours trek to Phakding (2610m). 35 min fly/3 hrs walk We fly to Lukla early in the morning with the breathtaking views of the Everest Himalayan chain. In Lukla, we meet our further crew (if you required) and arranging the things, we proceed to Phakding, walking above the Dudh Koshi River and enjoying the valley views, potato fields and the forest. Overnight at lodge. Day 04Trek to Namche Bazaar (3440m). 5-6 hrs Today, we walk almost up and up to the Sherpa hub, known as Namche Bazaar. First we cross few suspension bridges and enter to the Sagarmatha National Park. The gradual uphill walk is exciting with the greenery views of the forest and we get the first glimpse of Mt. Everest. Reach to Namche Bazaar and take a rest. Overnight at lodge. Day 05Rest and acclimatization day in Namche Bazaar. As we are climbing to the alpine region, we need acclimatization to fit in the thin air region. After breakfast, we walk around Khumjung and Khunde. On your interest, we can walk up to the Everest View Hotel. Then we come back to Namche Bazaar. Overnight at lodge. Day 06Trek to Thame (3800m). 4-5 hrs We have a gentle walk, but the rising altitude can be challenging enough. We pass various chhortens. As a first day excursion through the alpine altitude, we have only a few hours walk that helps you for acclimatization. Take a rest reaching Thame. Overnight at lodge. Day 07Rest Day (climb up to Sunder Peak (5368m) and come down to Thame. It's time to take an acclimatization rest. We begin to walk around after the breakfast. First we visit the Thame monastery, which is a place of interest to explore the Buddhism. Then we hike to the Sunder Peak and back to Thame. Overnight at lodge. Day 08Trek to Lungden (4380m). 6-7 hrs The more we walk higher, the fascinating scenery can be seen. Passing Tumla Kharka and Taranga, we reach to Marlung. Just a step ahead, there is our today's destination. Lungden is the base camp for Renjo la pass, which is a wonderful place with beautiful surroundings. Overnight at lodge. Day 09Trek to Gokyo over the Renjo La Pass (5360m). 8-9 hrs Among three high passes we do, Renjo La is the first we are going to deal. The wonderful views of Renjo Lake and Relma Tso can be explored. Some of the exciting mountain views include Konngde view, alpine landscape, Makalu, Tengi Ragi Tau, Rolwaling Range and the stunning surroundings. Then we trek down to the Gokyo valley, beautifully resided beside a high Lake. Overnight at lodge. Day 10Rest day (Climb up to Gokyo Ri (5357m). 5-6 hrs Early morning, we begin to hike towards the Gokyo Ri. It is an exciting viewpoint of the Everest, Makalu, Cho Oyu, Lhotse and the vicinity peaks. The Ngozumba glacier adds more attraction on the trek, which is the longest glacier in the Khumbu region. We can enjoy climbing the Gokyo Peak and gradually retrace to the Gokyo valley and take a rest. Overnight at lodge. Day 11Trek to Dragnag (4700m). 3-4 hrs We leave the Gokyo valley and head towards Dragnag after the breakfast. Enjoying the views of Makalu, Lhotse, Kusum Kanguru and the neighboring peaks, we head continually. We are on our next mission that is crossing the Cho La Pass, before that we take a rest at Dragnag. Overnight at lodge. Day 12Trek to Cho La Pass (5368m) and descend to Zongla (4830m). 7-8 hrs Before the sun rises, we begin our grand excursion towards the Cho La Pass. It is challenging enough to deal with. The top of Cho La 5368 meters is a wonderful viewpoint of the peaks of the Khumbu region, including Mt. Everest, Ama Dablam, Cholatse, Lobuche peak and others. Crossing the Cho La Pass becomes highly challenging in winter due to the high snow fall. However, even in the normal season, there can be snow and the route becomes slippery and special attention should be paid along with using some basic climbing equipments. Then we climb down gradually to Dzongla. Overnight at lodge. Day 13Trek to Labuche (4990m). 5-6 hrs The previous experience of passing two high passes, we find it easy to deal the gentle trekking trail though in the alpine altitude. With the physical fitness, we walk gradually From Dzongla to Labuche enjoying the views around, of the mountains and the glaciers. Thamserku, Kangtega and other peaks can be seen frequently. We reach to Labuche and take a rest. Overnight at lodge. Day 14Trek to Khongma La Pass (5530m) and to Chhukung (4730m). 8-9 hrs After breakfast, we head towards the Khongma La Pass, after crossing the Khumbu glacier. The last high pass of this trek is also the highest high pass among three. The top of the Kongma La is a brilliant viewpoint of the Everest Himalayas. From 5530 meters with a challenging walk, we trek down to Chhukung with 800 meters down. Overnight at lodge. Day 15Trek to Island Peak Base Camp and back to Chhukung. 8-9 hrs As a part of side trip on this journey, we walk up to the Island peak base camp. For those who have already crossed the high passes will find it easy to go and come back. Another beautiful part of the Khumbu can be explored today, include Imja Tsho. Then we back to Chhukung and take a rest. Overnight at lodge. Day 16Trek to Pangboche (3930m). 7-8 hrs From Chhukung, we continue to trek down through the up down trail to Dingbuche. Following the Imja Khola, we reach to Orsho, Somare and finally to Pangboche, the place, where the oldest monastery of the Khumbu region lies. The centuries old Pangboche Gompa is surrounded by various chhortens. Overnight at lodge. Day 17Trek to Namche. 6-7 hrs From Pangboche, we trek down to Deboche and through the stone steps, we reach to Tengboche, other widely renowned cultural spots of the Tibetan Buddhists. This is richly loaded by the spirituality. Via Phunki Tenga, we gradually descend to the Namche Bazaar. Overnight at lodge. Day 18Trek to Phakding. 5-6 hrs Almost, the trail is just downhill. We begin after breakfast and finally, check out from the Sagarmatha National Park check point. Crossing various steel bridges, we finally reach to Phakding, which is comparatively a short walk. Overnight at lodge. Day 19Trek to Lukla. 3-4 hrs We trek back to Lukla from Phakding. It’s a gentle walk through the easy trail. The view of the Dudh Koshi valley can be seen stunning. Arriving at Lukla, we bid farewell to the porters (if we have) and have a memorable evening. Overnight at lodge. Day 20Fly back to Kathmandu Today, we fly back from Lukla to Kathmandu enjoying the Everest region snow covered peaks. From airport, you will be transferred to hotel. Then you have a whole day to shower and rest. Overnight at lodge. Day 21Rest (Shopping) day After the tiresome excursion, today you have your own day. It may be valuable to do shopping and buy souvenirs for your family members and your friends. Then you can have a relax time. Overnight at lodge. Day 22Final departure day The last day of the trip, the representative of the Alpine Excursion Treks and Expedition drops you to the airport. Thank you for joining us for your memorable trip. See you again. Hotel 4 night in Kathmandu with BB plan (Bed and Breakfast). Air Ticket for Kathmandu to Lukla and Lukla to Kathmandu for clients. Air Ticket for Kathmandu to Lukla and Lukla to Kathmandu for guide and assistant. Accommodation and food during the trekking such as Lunch, dinner, break, fast, Tea, coffee etc. Well pay to staffs and porters. Transport Airport to hotel and hotel to Airport drop and peak up. Please Contact us for trip cost and more details. If the flights are delayed or canceled due to bad weather condition Alpine Excursion Treks & Expedition (P) Ltd. will not be responsible for such incidents. In case of emergency during the trip, Helicopter will be arranged by Alpine Excursion Treks & Expedition (P) Ltd. The charges must be paid by the clients themselves. Alpine Excursion Treks and Expedition Pvt. Ltd.